The Portland Art Museum has revised its plans for the Rothko Pavilion to better reflect and serve the community. Named for artist and former Portland resident, Mark Rothko the Pavilion will connect the Museum’s two buildings and ensure access for people of all ages and abilities. In response to public feedback, the Pavilion will welcome everyone, including individuals with bicycles or pets, from 7 a.m. to 11 p.m. daily. 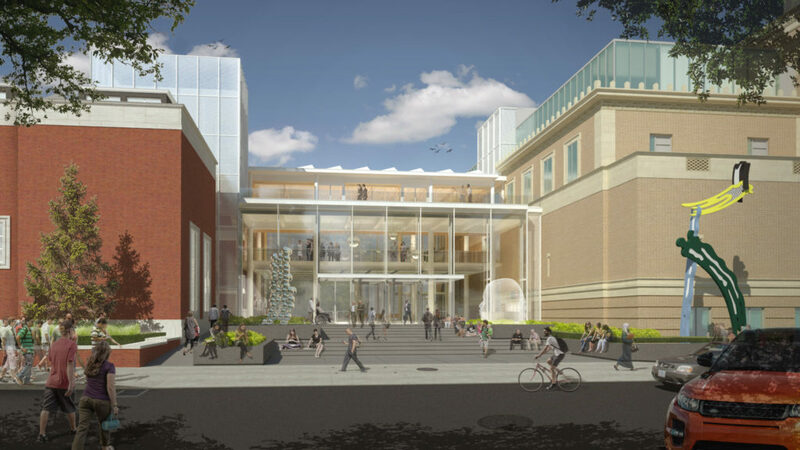 “We are committed to creating a space that enhances our city and broader community and have been listening to suggestions and concerns voiced by neighbors and others,” said Portland Art Museum Director Brian Ferriso. Ferriso will update the Portland City Council on these changes during a regular meeting that begins at 2 p.m. on Dec. 7. This will be the Museum’s second appearance to discuss the Pavilion. In April 2017, the Museum requested a change to the city ordinance governing the section of SW Madison Street that runs between the campus buildings. The mayor and commissioners heard public testimony from the Museum and from community members. In addition to adding 30,000 square feet of community and exhibition space, the Pavilion enables changes to the layout of the two other buildings. These changes enhance access within and through the Museum by offering three new barrier-free connections at three levels between the buildings, and improved vertical way finding and elevator access. The Museum is in the process of working with advocates from the disability community, along with an internal team and a range of stakeholders and community partners. An accessibility advisory committee led by a respected local disability rights advocate and artist will be formed, and a comprehensive ADA audit scheduled for early 2018, among other initiatives. The Museum is asking the council to modify the city ordinance to allow for the enclosed passageway. The hours will reflect what the ordinance currently allows. This expansion and renovation project represents an investment in the city and future generations of Portlanders. While museums and arts organizations are struggling in other cities, this estimated $50 million project reflects an investment and a commitment to a vibrant arts community in Portland. Funding comes mostly from the private sector, with $1 million coming from the State of Oregon. The Pavilion, Community Commons, and Plazas will enhance existing events including Wordstock, The Portland Public Schools heART of Portland arts showcase, free concerts, and Potluck in the Park Christmas Dinner. Additionally, the Museum intends to continue to explore possibilities for the space through a community-centered planning process.